Evington Park is one of the city’s many parks. It offers a range of outdoor sports including tennis courts, bowling greens and orienteering. It’s a lovely open space in the city to stroll and to picnic on the grass. You might even spot some of the wooden sculptures among the trees. All the details about the park can be checked here. 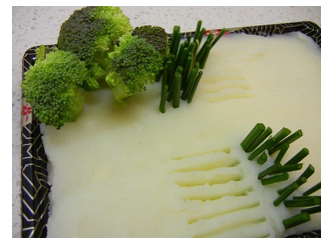 Here is an idea made using mashed potato and vegetables. Maybe your creation could be made from fruit? Or sweets? Our county campsite is close by! You could book in for the a day visit and make use of the facilities such as grass sledging, mountain biking, the bouldering wall and even ending with a campfire! Head to the Topstones website to book your day out! A short walk from Topstones is Seldom Seen Farm. In the summer, you can pick your own strawberries and raspberries straight from the fields – you could bake a cake with them back at Topstones or add them as a tasty treat to your picnic. There is a café there too for a spot of tea and cake!